The video above is the introduction for our school film festival on the theme of motion. Every video in the festival was aligned to 8th grade California physical science standards. All the videos were created with the web-based subscription service Powtoons. I have been the lead on a successful film festival and a mediocre film festival. Both film festivals happened in the same year with the same students. The problem is in one festival we had the entire school in the cafeteria, invited guests, and presented a top 10 of videos where my charismatic principal took the lead as an MC. In the other festival we rolled the films during lunch time and each grade level could watch them as they played. On this project I was the lead and was nowhere near as engaging or energetic as my principal had been in the previous film festival. The first festival was transformative and students talked about it for a long time while the second festival was a failure because the students weren’t engaged. What I got out of that lesson was that if you make it a BIG deal, it is a BIG deal. If you are going to make a film festival then go all-out; add a red carpet, pack the cafeteria, use the best projector and sound system you have, fire up the popcorn machine, create fliers and posters, and have students privately vote for film categories. Please, please, please, I beg you do not just tell students “here is this animation program, let’s see who can make a video for our film festival!” There will be students who will learn the program automatically and will not want any help, but for you to make a difference with all learners you will definitely need to adjust your teaching practices for different students. 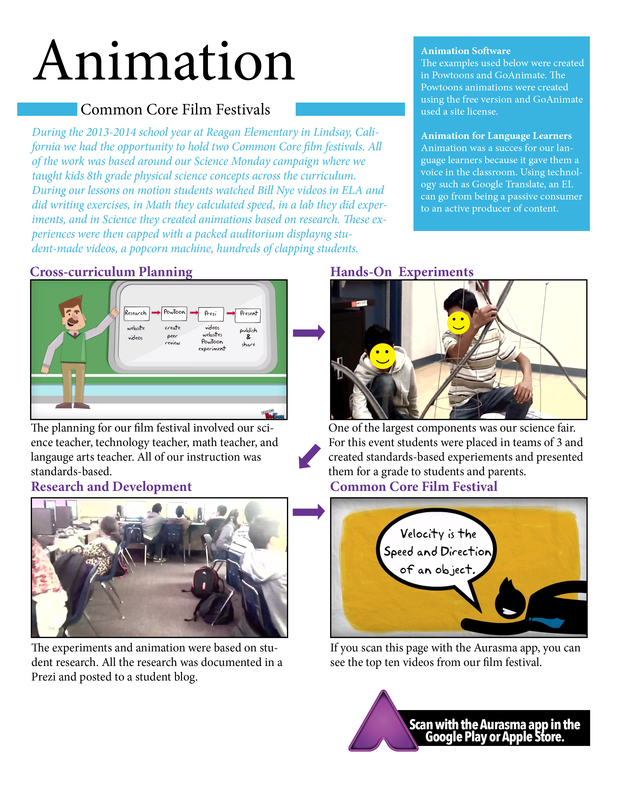 A well-implemented film festival can change the culture of your school. You can make the film festival a community event by inviting parents or the entire school site. Through a film festival you will see new talent that was underrepresented at a school. You will need a site license for a program like GoAnimate or Powtoons. Someone at your school site will need to administer the online management system. You will need to have a plan in place for students to learn the technology (more on that below). I have been part of two different roll-outs of GoAnimate and Powtoons. In one instance I taught my class how to use the software and then other teachers would send small groups of students to learn 1-on-1 from my students. In a separate roll-out we had 1 student teach a small group of 5 from a different classroom and then those 5 students taught another small group within their classroom. When the entire classroom had learned how to use the software they went and taught more classrooms 1-on-1. The classroom we taught from a different school site even went on to create their own “animation day” once a week after school for students to dive deeper into the software. Next post Section 2: How can I use animation with language learners?